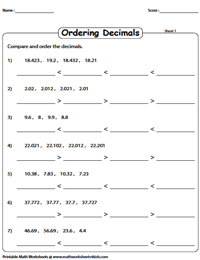 This webpage encompasses a combination of worksheets based on ordering decimals with a view to enhance a student's knowledge on decimals and their place values. 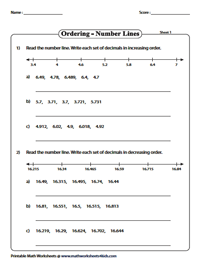 A number of worksheets are stacked with a variety of exercises include ordering decimals in place value boxes, using the number line, and using the greater than and less than symbols. Riddle worksheets require you to order decimals to decode the riddles that are sure to tickle your funny bone! Click on the various download options to access the entire gamut of worksheets under this topic. 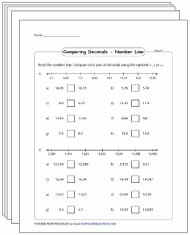 This assortment of 70+ worksheets consists of captivating exercises and activities on comparing decimals using greater than, lesser than and equal to symbols. 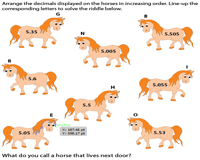 Keenly observe each set of decimals and fill them in the correct place value boxes provided. Order the decimals from the least to the greatest and vice versa. Decimal numbers are given in random order. Set them in the correct order in accordance with the greater than and less than symbols provided. There are seven problems in each worksheet. 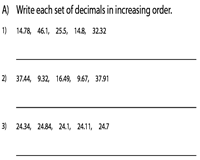 Order each set of decimals in either increasing or decreasing order. Levels 1, 2 and 3 contain decimals up to hundredths, thousandths, and ten thousandths respectively. 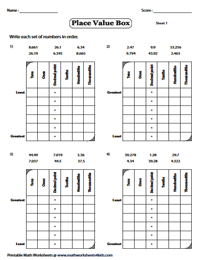 Read each decimal number displayed on these vivid theme-based worksheets. Order them in either increasing or decreasing order to decode the rib-tickling riddles! 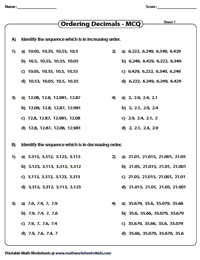 Identify the correct sequence of decimals in either increasing or decreasing order with this set of MCQs. This activity forms a perfect tool in evaluating a child's analytical and logical skills. Read the number line. Arrange each set of decimals in either increasing or decreasing order as specified. Rule: Decimals to the right of the number line will always be greater than the decimals to the left of it.